Bull. Soc. mycol. Fr. 49: 373. 1934. Synonym: Naucoria cucumis (Pers.:Fr.) Kumm. Cap 2.0-5.0 cm broad, broadly conic to convex, in age sometimes plano-convex with a low umbo; margin when young, incurved, irregular in outline, especially when clustered, decurved at maturity; surface at first sparsely pubescent, soon smooth, translucent-striate, hygrophanous, dark brown to chestnut-brown with an underlying orange tinge, shading to a yellowish-buff margin, in age dingy-buff overall; flesh thin, watery-brown; odor, of cucumber; taste mild or faintly of cucumber. 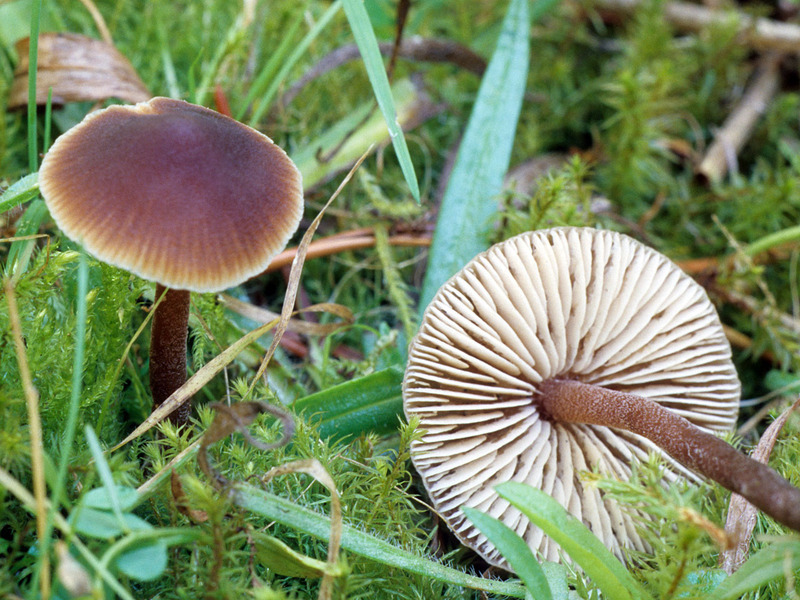 Gills notched, uncinate or subdecurrent, close to crowded, moderately broad, thin, at first buff-colored, in age pale-brown, discoloring darker brown where bruised. 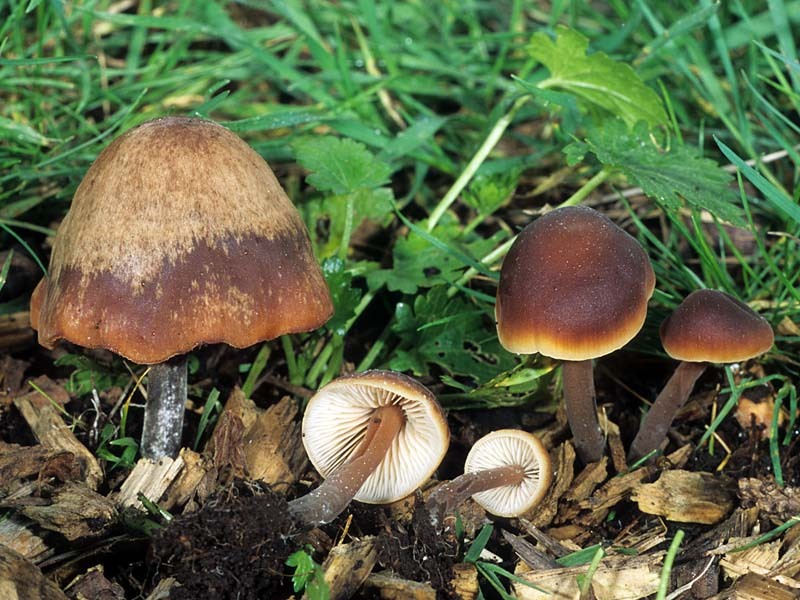 Stipe 3-5 cm long, 2-6 mm thick, more or less equal, cartilaginous, pliant, hollow, often grooved or flattened in cross-section; surface pruinose, occasionally smooth in age or from handling, usually dark-brown, but sometimes buff-brown at the apex; flesh thin, dark-brown; veil absent. Spores 6.5-8 x 3.5-4 µm, elliptical, smooth, thin-walled, nonamyloid; spore print pinkish-brown. Scattered to clustered on woody debris or downed wood; fruiting from late fall to mid-winter. Once considered rare, Macrocystidia cucumis is becoming more common as a result of the practice of grinding fallen trees into chip-mulch. 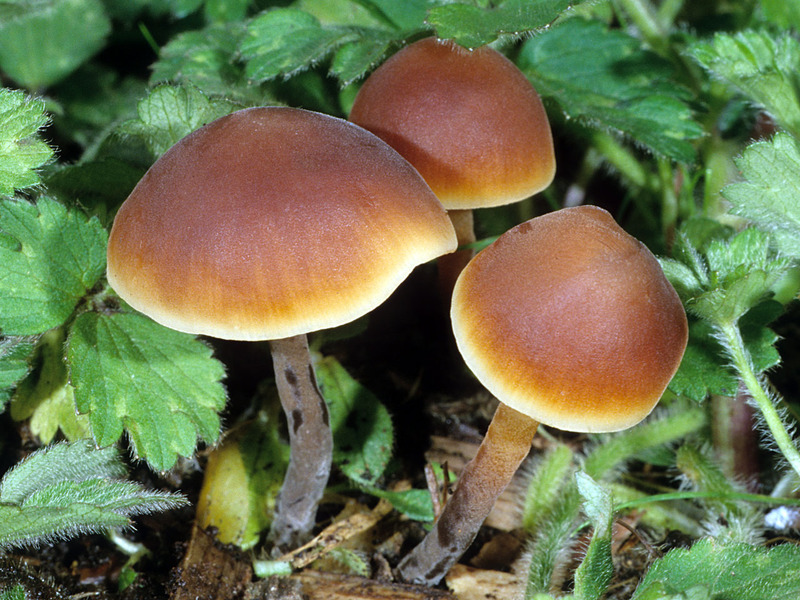 When fresh, it is a handsome mushroom, the cap translucent-striate, dark-brown to brownish-orange with a contrasting lighter margin. 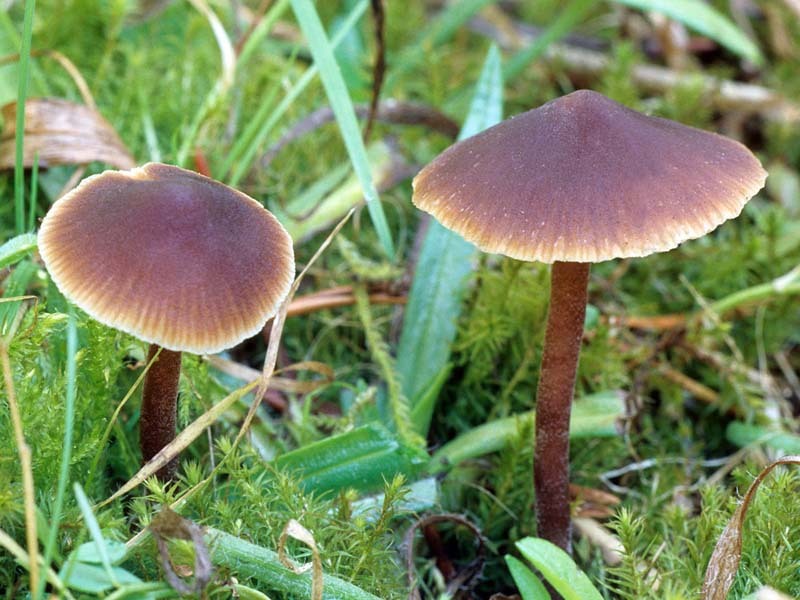 It soon fades, however, to an unattractive dingy-buff, but still can be recognized by a dark-brown, pruinose stipe and pinkish-brown spore print. The pinkish spores are suggestive of the family Entolomataceae, but members of this group have angular, not elliptical spores. 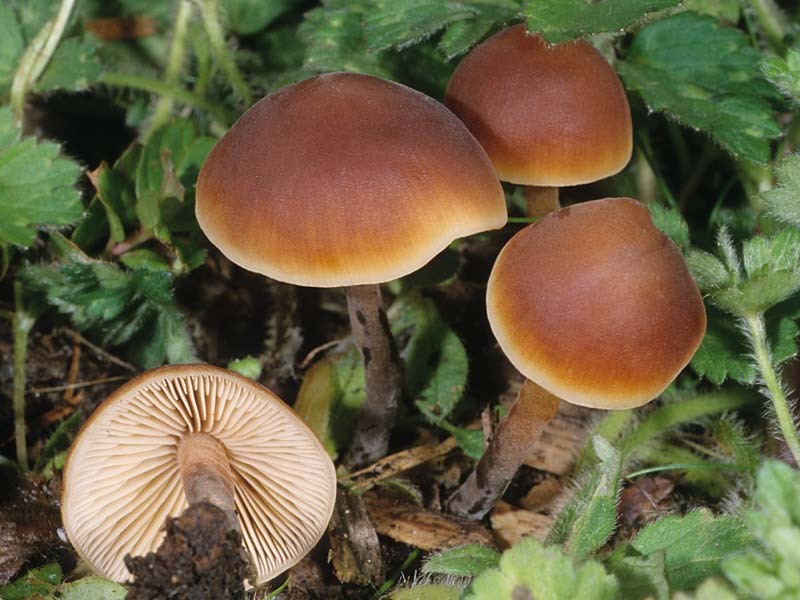 It is sometimes confused with Flammulina velutipes another lignicolous species, but the latter lacks a cucumber odor and has white rather than pinkish-brown spores. Bas, C., Kyper, T.W., Noordeloos, M.E. & Vellinga, E.C. (1995). 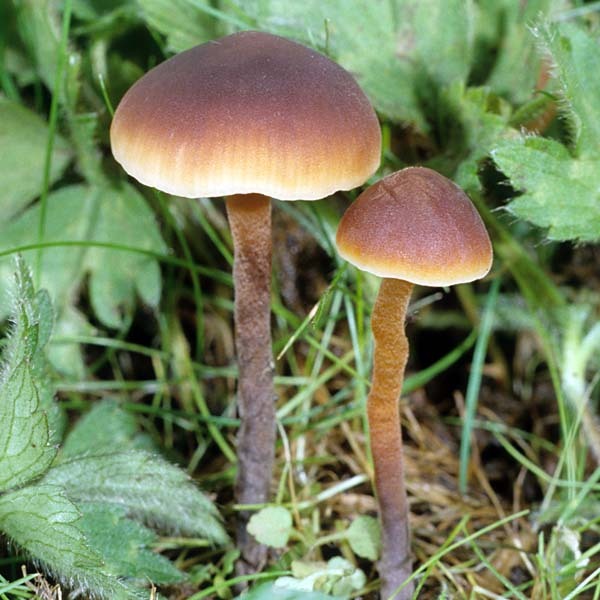 Flora Agaricina Neerlandica—Critical monographs on the families of agarics and boleti occuring in the Netherlands. Volume 3. Tricholomataceae. A. A. Balkema: Rotterdam, Netherlands. 183 p.
Knudsen, H. & Vesterholt, J. ed. (2008). Funga Nordica: Agaricoid, boletoid and cyphelloid genera. Nordsvamp: Copenhagen, Denmark. 965 p.
Stuntz, D.E. & Isaacs, B.F. (1962). Pacific Northwestern fungi. I. Mycologia 54: 272-298.